Are you interested in understanding why every successful team has a set of consciously created or gradually developed team norms that support the interaction of the team members? Do you need sample team norms or group relationship guidelines to provide a model for your own organization's teams? This sample demonstrates the kind of relationship guidelines that effective and successful teams adopt in their interaction within the team and with the world outside of the team. These group norms are essential for a team to accomplish its mission and live the values that members cherish. What Makes a Team Effective and Successful? Every team you form has two components that team members must pay attention to if the team is going to succeed. The team must pay attention to the content mission (or goals or outcomes) expected from the team. This is the content that the organization has asked the team to create or the mission that is the reason for the team existing in the first place. Secondly, the team must also carefully shape and monitor the team process it uses to accomplish the goals. Some who sponsor teams, build teams, or work on teams will tell you that most team problems have to do with the relationships and process adopted by team members with themselves or the outdside world. What Is Team Process and How Do You Manage It? How team members will be responsible and accountable for moving the project forward and accomplishing the goals. Long cited statistics demonstrate clearly where the majority of teams experience their most significant problems. They attribute 80% of the problems they experience to the process side of this equation. Teams experience 20% of their problems on the content or mission part of the equation. This explains why the development of team norms for the process side of the equation is so important. Norms will naturally become established as people work together on the project. Why not create norms that support the accomplishment of the team's goals—sooner and with conscious consideration? This is similar to why you might also want to consciously create your organization's culture to ensure an environment that is supportive of team success. These team norms or group ground rules are established with all members of the team participating equally. The manager of the team or the team's company sponsor or champion is included in the discussion and must agree to practice the relationship guidelines developed. Here are sample process norms or group guidelines that a team might use to effectively conduct its business. 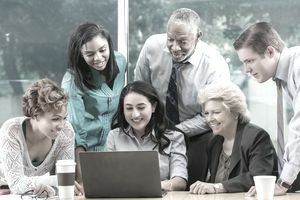 You may use these sample team norms as a starting point, but each team needs to go through the process of generating and committing to its own team norms—so don't plan to use them verbatim. This is the only way in which the team will own the norms and agree to abide by the team norms. This is also how teams establish a tradition of policing each other—kindly and respectfully—when a team member fails to honor the team's group norms. These are sample team norms or group relationship guidelines that real life, working teams have selected for their own use. Perhaps they will assist you to create your own team norms. Treat each other with dignity and respect. Be genuine with each other about ideas, challenges, and feelings. Trust each other. Have confidence that issues discussed will be kept in confidence. Managers will open up a space in which people have information and are comfortable asking for what they need. Team members will practice a consistent commitment to sharing all the information they have. Share the complete information that you have up front. Listen first to understand, and don’t be dismissive of the input received when you listen. Don’t be defensive with your colleagues. Rather than searching for the guilty, give your colleagues the benefit of the doubt; have a clean slate process. Support each other—don't throw each other under the bus. Avoid territoriality; think instead of the overall good for the company, your employees, and your customers. The discussion of issues, ideas and direction will not become a personal attack or return to haunt you in the future. Managers are open, communicative, and authentic with each other and their teams. It's okay to not know the right answer and to admit it. The team can find the answer. Problems are presented in a way that promotes mutual discussion and resolution. It is safe to be wrong as a manager. Thoughtful decision-making is expected. Honesty is cherished. You must own the whole implementation of the product, not just your little piece; recognize that you are part of something larger than yourself. Be responsible to own the whole picture. Practice and experience humility—each of the team members may not have all the answers. If you commit to doing something—do it. Be accountable and responsible for the team and to the team. It is okay to be the messenger with bad news. You can expect a problem-solving approach, not recrimination. Promise to come prepared for your meetings and projects so that you demonstrate value and respect for the time and convenience of others. Strive to continuously improve and achieve the team's strategic goals. Don't let ineffective relationships and interactions sabotage the team's work. In summary, teams need to expend the effort to practice all of these norms and to care enough about the team and its work to confront each other, with care, compassion, and purpose, when a team member fails to practice these norms. What's Included in an Employee Performance Improvement Plan? Need a Job Offer Letter Sample for an Employee Early in Their Career? Need a Sample Employee Handbook Introduction? How Can Employees Gain Access to Viewing Their Personnel File? Need a Sample Paid Time Off (PTO) Policy?